Economical in-house marine grade paint colors at a savings. 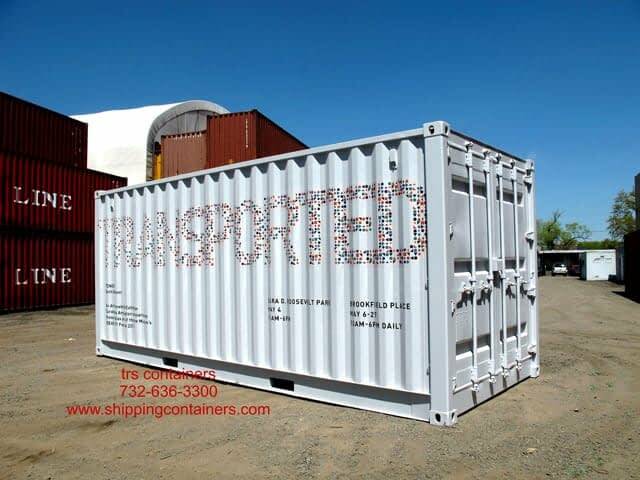 Protects the steel and improves the containers aesthetics. Custom colors and 2-part painting services. Installation of corporate logos, identification numbers, pre-fixes for overseas shipping. Paint floor with enamel deck paint and sand additive for anti-skidding. Paint interior plywood in modified containers to extend life. Cold applied brush or spray coating protects the corrugated container roof from snow, rain and rust. 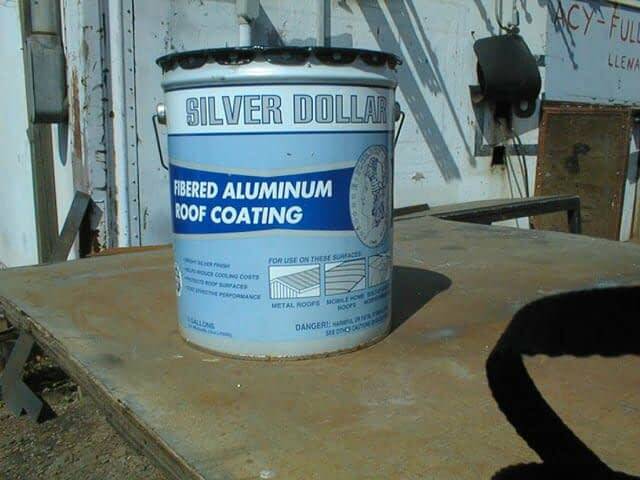 Apply metal roof coatings that are reflective and rust-resistant. Silicone roof coating prevents against leaks from ponding water. Rubberized coating with fibers to adhere to metal and resists cracking. Light weight 26 gauge manual mini-warehouse rollups that roll onto a rod. Heavy 20-gauge manual or motorized steel doors that roll into a canister. Submarine doors for modified boxes positioned on a rig or barge. Pop-up panels for special events and retail space. Insulated Personnel doors: locking hardware, raincap, deadbolt. Window + vent option. Dutch Doors with framed glass windows. Basic single glazed double hung or sliding glass models in stock sizes. Options: bug screens, protective metal covers, steel bars. Custom tinted for sun protection or privacy. Large panel glass with protective metal grating for drilling rigs or control rooms. Skylights: framed plexi that do not open or larger pop up units. Windshield wipers for Command Centers. 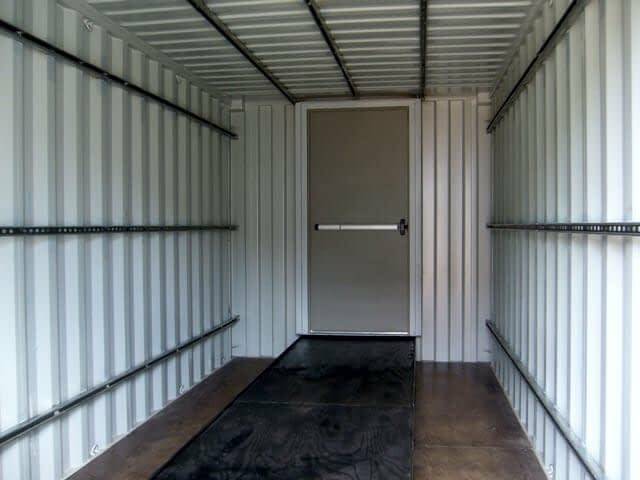 Install steel lockboxes on container swing doors and personnel doors. Mount lockable bars across man doors to deter vandals. Tack weld stationary bars over container windows. Install alarm systems for extreme security. 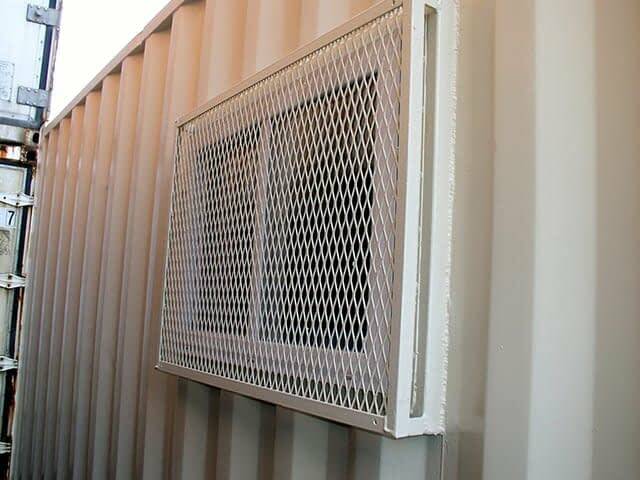 Expanded metal a/c window cages with non-removable hex screws. Oversized grated window frames to protect from flying debris. Specialized locks that cannot be drilled or picked; cipher and hockey puck locks. 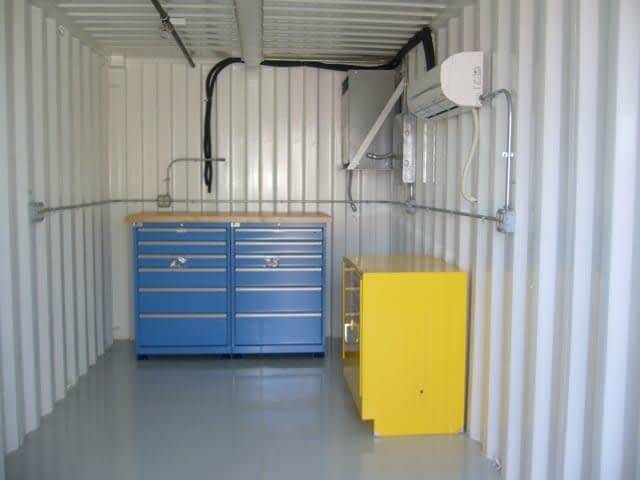 Installation of fire suppression systems when storing hazmat and flammable materials. 110v / 220v wiring behind the paneling. Interior panel box installed with multiple circuits. fluorescent double bulb fixtures, LED lighting with remote control, option to change the LED colors remotely, vaper tight LED wet location fixtures, fully gasketed explosion proof lighting, emergency LED exit sign with light. Quad + duplex GFCI receptacles. Toggle switches with or without outlets positioned near the door. Window mount 110 or 220V HVAC units. 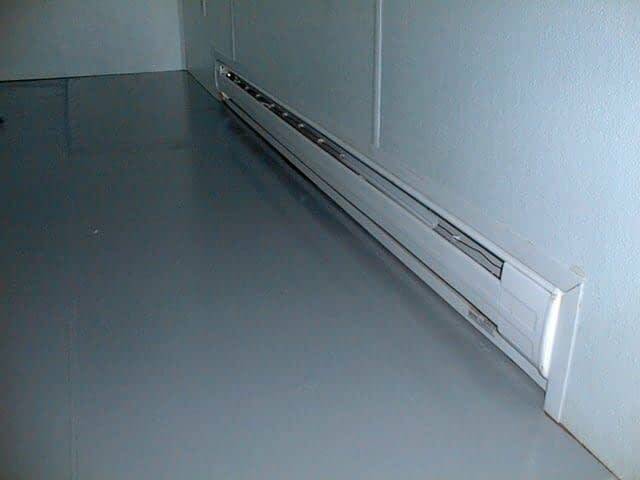 Window Air Conditioning unit with thermostat controlled baseboard heaters. Wall mount Bard HVACs for climate control. Original 1.25” marine plywood or hardwood floor. Clean, sand, stain and polyurethane the original wood. Install linoleum, vinyl composition or Interlocking rubber tiles, carpeting with kick moulding. Install a flat panel steel overlay with full weld or tack weld. Install steel or aluminum diamond plate over original wood or remove the wood. Welded spill containment basin with permanent or removable steel floor grating. Walls are subject to moisture with extreme temperature fluctuations. To maintain a dry environment TRS recommends insulation. Frame, insulate and panel containers to contain condensation. Alternative: glue rigid board insulation to the walls. Options: luan wood grain, plywood grades A – D, medium density fiberboard, washable FRP textured panel, sheetrock, OSB board, and perforated metal. 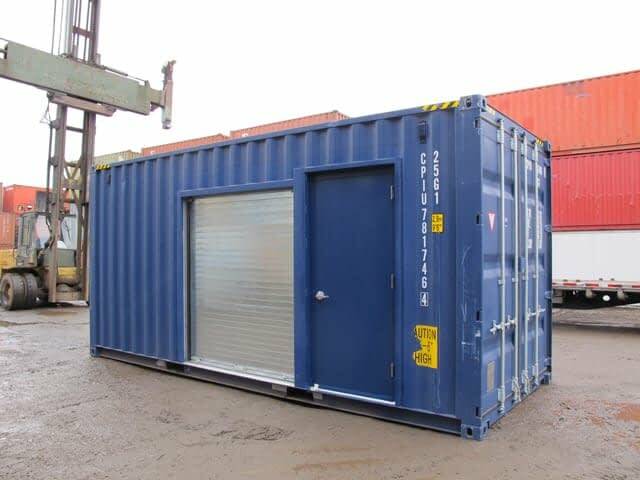 TRS panels over the 2 swing container doors or we frame each door for complete access. Insulation: R11 and up Fiberglass rigid board, fiberglass batt insulation, Polystyrene and spray foam. Steel personnel doors with emergency panic bar on interior. NiCad long lasting batter operated emergency LED exit sign with lights. Installation of explosion proof vaportite light fixtures, exhaust fans, and smoke detectors. Fire extinguishers installed with safety signs. 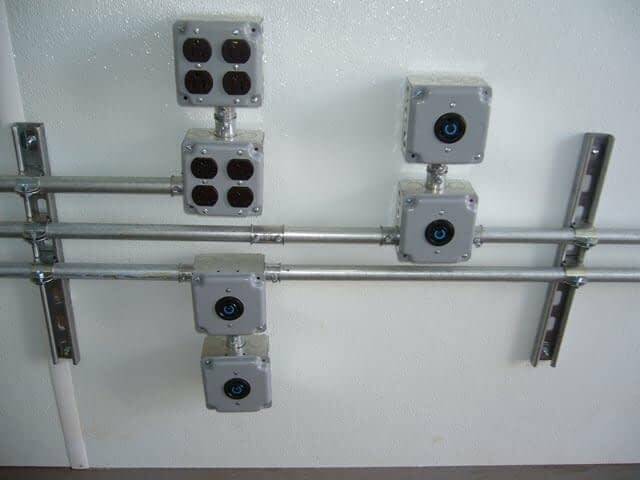 Sprinkler systems with safety cage. 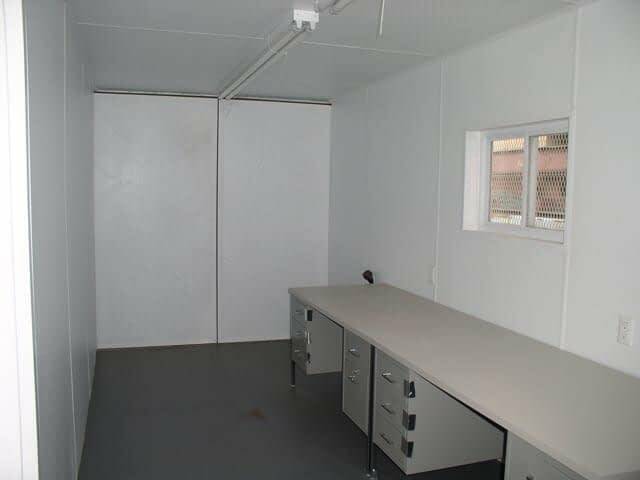 Ductless fume hoods installed in container labs to filter contaminants out of the air. 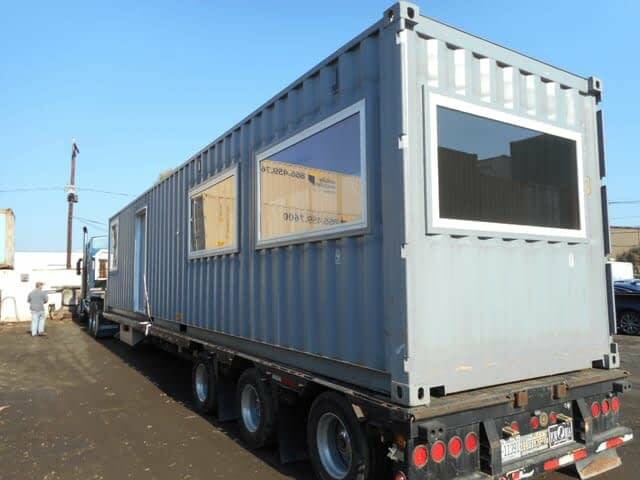 Furnishings to make the modified container ready to move in. Install partitions or walls and doors to provide privacy. Shelving and racks to meet the weight requirements for welding rods, pipe, files, tools, track, etc..
Furniture offered: Desks, Counters, File Cabinets, Hooks, Lockers, drill press, transformers, Lista overhead tool cabinets, book cases, battery racks, chairs, magnetic dry boards, window treatments, etc. 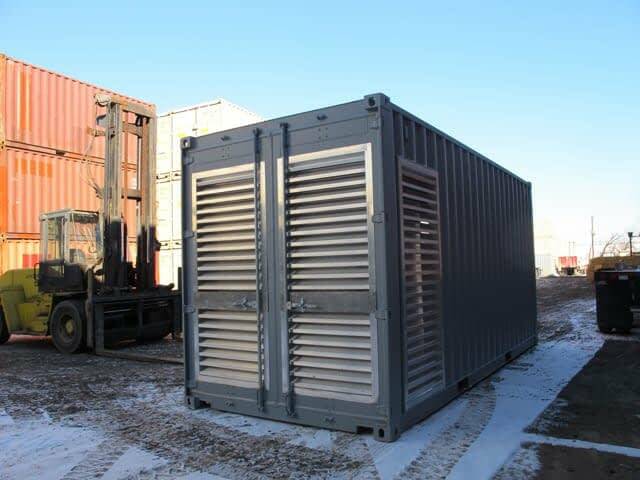 Due to the watertight and airtight nature of an ISO shipping container venting is an option to provide fresh air flow. Vents and exhausts help keep moisture and condensation under control. They also remove heat buildup. Electrically powered vents and thermostatically controlled exhaust vents and coordinating fume hoods. Vents: mechanical air driven turbine, flat slat louver vent with bug screen, mega vents and Supply/Return grills for generators. 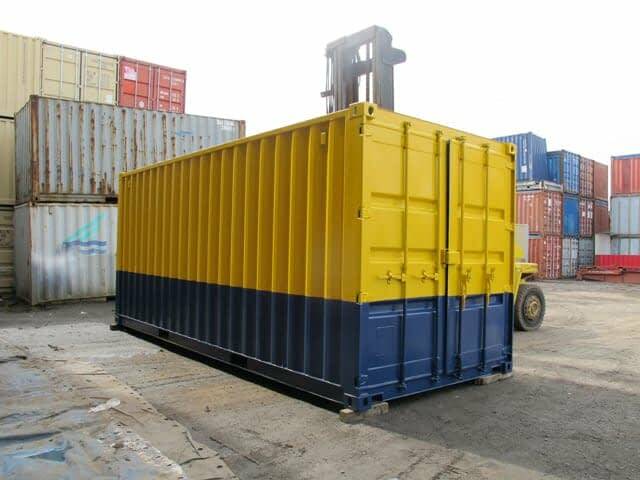 When storing equipment that requires fuel your Municipality may mandate venting the container for safety.